Xiaomi's Sub Brand Poco could launch soon its new smartphone Poco F2. This phone will be the upgraded variant of the company's first smartphone Poco F1. Recently many information related to the phone was revealed. Now the smartphone has been seen on the benchmark listing site Geekbench. The listing also revealed the main specifications and features of the phone. 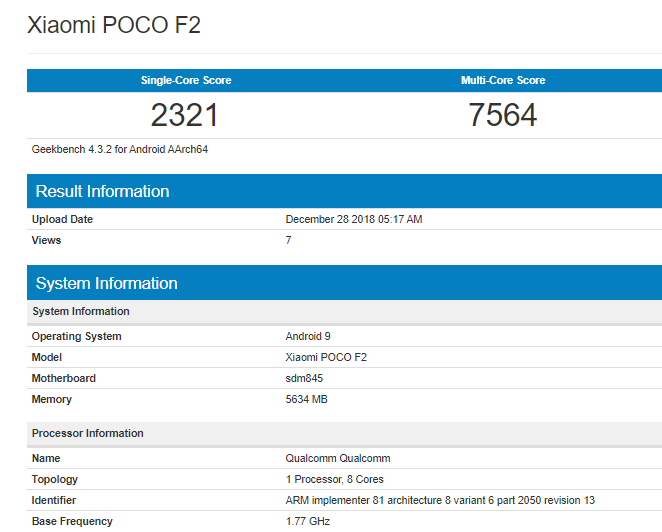 The listing on Geekbench site shows the Snapdragon 845 processor in Poco F2. we know, this processor was also given in Poco F1. However, there are reports that Snapdragon's 855 processor can be given in the new Poco Phone. According to the Geekbench listing, The new Poco Phone will work on Android Pie 9.0. Also, the listing has revealed that the phone can be given 6 GB RAM. Also, an 8 GB RAM variant of the phone can also be offered. In the Geekbench listing, the phone has scored 2,321 in single core and 7,564 in Multicore. Remind you that, this week, Xiaomi has introduced 6 GB Ram +128 GB memory variant of the Armored Edition of Poco F1 India. The new variant of the phone has been priced at Rs 23,999. During the launch of August 2018, the Armored Edition of the phone was launched in the 8 GB RAM + 256 GB memory variant.